This is the scooter I built when I was 13. 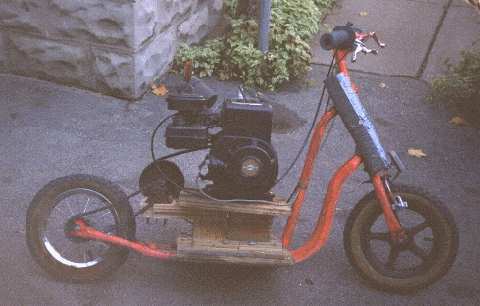 It uses a Briggs and Stratton horizontal crankshaft engine salvaged from an old lawnmower. The engine wasn't working when I bought it (for 25 bucks Canadian). I replaced the points, point plunger and air filter and It worked OK. After I gave it a valve job it worked like new. The top speed is about 30 KPH. The dirve train is made up of the manual clutch from the same lawnmower I got the engine from, a converter to convert the belt drive to a chain and then the clutch and brake mechanism in the back wheel. The brake in the back wheel is not used. The engine is still started with the origional recoil starter rope. However, it is shut off by means of a small button on the handle bars. Where do you sit? You don't! You stand. Thats why its called a scooter (Duh! ).